Large hand painted glazed ceramic cookie jar Made in China for Nonni's. Old world Saint Nicholas wears a long maroon robe and holds a lantern and gift. Lid has a freshness seal. Perfect condition. Measures 12 1/2" tall. 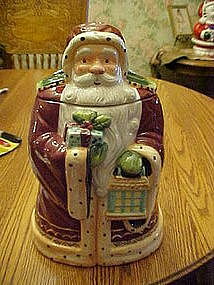 A very nice cookie jar for the Christmas holiday.